Since late last Tuesday evening, grief has choked all the oxygen from the air, making it nearly impossible to breathe deeply and move on. It seems like everyone is feeling it. Or if not everyone, at least women, Muslims, African Americans, Latinos, college students, half of America, much of the world and every single person I know. Gays in particular are grieving, myself included. How could we not? The most progressive eight years in American LGBT history — during which the White House literally morphed into a rainbow flag — have now been punctuated by a giant, orange interrobang. 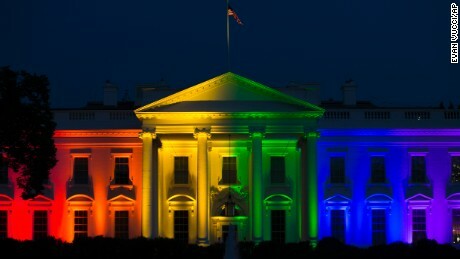 We’re mourning the loss of the queerest-friendly POTUS, FLOTUS and potentially SCOTUS the country has ever known. Even Bo, the Obama’s Portuguese water dog, was dubbed the first openly gay White House pet. As someone who apprehensively came out during the George W. Bush administration of proposed constitutional amendments banning gay marriage, I’m not surprised that young gays are among the most scared this week. The Crisis Text Line is a free, 24/7 support service for those in crisis — 80 percent of whom are under the age of 25. On an average day, the line sees about 1,000 texters. But over the course of Election Day, that number jumped to 2,000. Then, from Wednesday morning to Thursday morning, it doubled again — the largest sudden increase in volume ever. (Traffic has remained high ever since.) The top two words mentioned in texts were “election” and “scared,” and the most common association with “scared” was “LGBTQ.” Phone lines at the National Suicide Prevention Lifeline have also lit up at unprecedented volumes over the last week, mainly from LGBT people. Grieving over what happened on Election Day as you might the death of a family member is understandable, Braha explains, because grief can be an expression of hurt felt after a loss of any kind — a job, a relationship or, in this case, a presidential election. All the more so because this election involves saying goodbye to a president who for many represents the best we have to offer. Our head and heart feel like they’re riding shotgun in a one-star Uber Pool with the windows rolled up. We tend to rely on Kübler-Ross to help us make sense of grief, and for good reason — a lot of what she says is relevant. I definitely denied this was actually happening on Tuesday: There had to be a sack of uncounted ballots under a desk in Wayne County somewhere, right? “Let’s not forget, everything went so late,” notes Yvonne Thomas, PH.D., a Los Angeles based psychologist. Wednesday was awash in confusion since many of us got Wolf Blitzfaced until 2 a.m. and stumbled into work a couple hours later muttering gibberish about Wisconsin and the electoral college. “It didn’t feel like it was even possible,” Thomas adds, “It was a really tough time.” Anger has been consistently spewn across 25 cities and on college campuses nationwide. “Rather than protecting us from Trump, CNN normalized his behavior,” Wallace Mulligan, the organizer of a protest outside the CNN building in Los Angeles, told LAist. Bargains abounded. Recurring donations to the ACLU were pledged. Even Hillary seemed to be rationalizing, pinning the blame squarely on James Comey and taking long walks through the woods with Bill. And it’s totally safe to say depression loomed, for all of us. But what if acceptance never comes? Are we relegated to riding a vomitous roller coaster beneath a broken sewage pipe of dejection for the next four or (God forbid) eight years? I raise this question to Braha, who responds with a question of her own. The thing is, part of me definitely has for the last eight years. At least, the part that hopes to get married one day and regularly quotes Friday Night Lights. A is for “accept reality’”— stop engaging in counterfactual regret. “This is the reality. For whatever reason, he won,” she says. And then T is for “take action.” Whether that’s getting civically engaged, running for local office, doing charity work, protesting, writing or just being there for loved ones — whatever makes you feel like you’re working toward the vision of a reality you want. For many women, taking action will involve marching in Washington D.C. (or one of a number of coordinating cities) the day after Trump’s inauguration. Others are choosing an issue that was important to them in the election and volunteering for or donating to organizations like Planned Parenthood to support women’s rights, The Trevor Project to help LGBTQ youth, Showing Up For Racial Justice to combat racism, Campaign Zero to end police violence, or the Council on American-Islamic Relations to support Muslims. Still others are encouraging voters to show up for the next election by becoming a poll worker. As for me, I just submitted an application to volunteer with the Crisis Text Line.